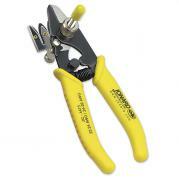 Detailed listing of our wire wrap tools and supplies. The Telecom Wire Wrap Kit is a complete field service wire stripping and wrapping kit with eveything you need to get the job done. The Telecom Wire Wrap Tool Kit features an aluminum wire wrap gun with 22-24 AWG wire wrap bit and sleeve, plier-style wire wrap stripper/cutter 22-24 AWG, hand wrap and unwrap tool (22-24 AWG) all packaged in a convenient leather holster that easily fits on any tool belt. 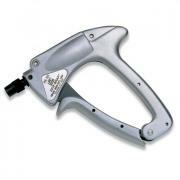 The durable Jonard Aluminum Wire Wrap Gun produces wire-wrapped connections with just a squeeze of the trigger while the plier-style Stripper/Cutter is a great combination tool that produces a perfectly cut and stripped wire with a squeeze of the cushion grip handle and a pull. The hand wrap-unwrap tool goes from wrap to unwrap with just a flip of the cap. The PTX Series Wire Wrap Tools were ergonomically designed to reduce the incidence of repetitive motion injuries associated with wire wrapping. The combination of light weight, short-throw trigger, long handle and high speed makes this tool ideal for high volume production along with comfort and safety. Wraps and unwraps 18 to 30 AWG wire. 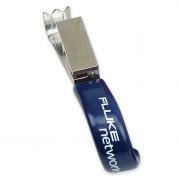 Requires the use of wire wrap bits and sleeves, sold separately (see below). The combination of light weight, short-throw trigger, long handle and high speed makes this tool ideal for high volume production along with comfort and safety. Wraps and unwraps 18 to 30 AWG wire. 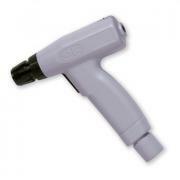 Cordless wire wrap gun includes charger and two batteries. 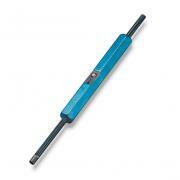 Requires the use of wire wrap bits and sleeves, sold separately (see below). Quickly and easily wire wrap with a simple squeeze of the trigger. Now solderless wire wrap connections are easy and fast using this heavy-duty, high-impact aluminum tool. With every squeeze of the trigger the bit turns 10 revolutions. 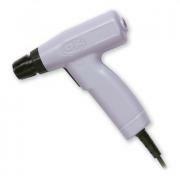 Requires the use of wire wrap bits and sleeves, sold separately (see below). Quickly and easily wire wrap with a simple squeeze of the trigger. Now solderless wire wrap connections are easy and fast using this heavy-duty, high-impact Lexan tool. 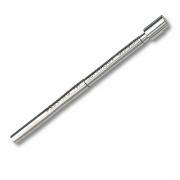 22-24 AWG Wire Wrap Bit with a .075 hole diameter. 22-24 AWG Wire Wrap Sleeve (red). 24-26 AWG Wire Wrap Bit with a .075 hole diameter. 24-26 AWG Wire Wrap Sleeve (yellow). 30 AWG Wire Wrap Bit with a .040 hole diameter. 30 AWG Wire Wrap Sleeve (grey). 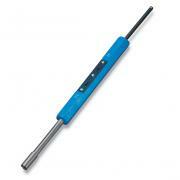 24-26 AWG 5" Wire Wrap Bit with a .075 hole diameter. 24-26 AWG 5" Wire Wrap Sleeve (black). The latest development in wire stripping and cutting. Simply place the wire in the stripping slot. 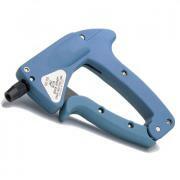 Squeeze the ergonomic grips and pull. The wire is stripped and cut to the exact length required. Comes with interchangeable blades (22-24 AWG & 24-26 AWG). Quick no-tool adjustment. A revolutionary concept for easy and clean stripping of wires for wire wrapping, electronic and appliance application. Biomechanically designed for maximum efficiency while the hardened steel cutting blades and sturdy construction of the tool ensures long life. Strip length easily adjustable. This wire wrap tool does the job of two. This two-sided tool allows for quick change from wrapping to unwrapping and back, while the unused side serves as a handle. 6" in length for wire gauge 22-24. 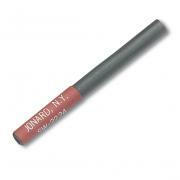 A versatile unwrapping tool with a spring loaded sleeve which covers and protects the delicate leading edge of the bit. Just pull the sleeve back to expose the point for unwrapping and then rotate the tool. Release the sleeve and the bit is protected from accidental drops and dings. 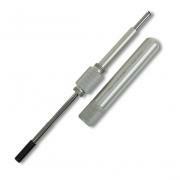 This unwrap tool handles 20-26 gauge wire and is 5.5" in overall length. 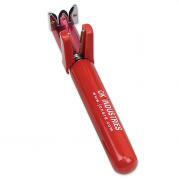 Economy Wire Wrap/Unwrap Tools are ideal for bench or field service. Wraps, unwraps and strips wires with unique blade. The 22-24 AWG fits .045" square posts. Wraps, unwraps and strips wires with unique blade. 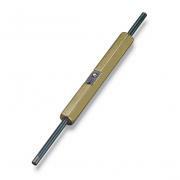 The 30 AWG fits regular or .025" square posts. Wraps, unwraps and strips wires with unique blade. The 0 AWG fits regular or .025" square posts and a 30 AWG modified. 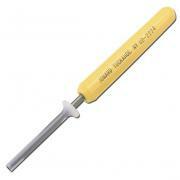 The quick effortless way to strip insulation without nicking the conductor. Ergonomically shaped and made of durable stainless steel with a cushion grip. Strips 22/24 AWG wires and cuts them to 1 3/4" length for wire wrap applications.